This album includes sixteen beautiful songs for Lent sung by Marilla. The Holy season of Lent is a time of fasting, prayer and penance, which prepares us for the glorious ressurection of our Lord. 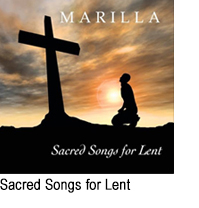 Let these beautiful sacred songs selected from Marilla’s albums help you to meditate on the passion, death and overwhelming love of our Lord Jesus.